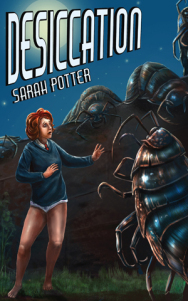 Sarah Potter, author of the wonderfully weird and quirky ‘Desiccation,’ a science fiction novel billed as a ‘young adult crossover fantasy,’ has kindly afforded me a guest storyteller spot on her blog this month. Hopefully, in the coming weeks, I can reciprocate, for if her book is anything to go by, a chat with Sarah is likely to be very entertaining indeed. Posted by Cee Tee Jackson on April 3, 2016 in News and tagged desiccation, fantasy, humor, humour, quirky, young adult. Thanks, Cee Tee. I like that description of my book:-) And it’s a pleasure having you starring on my blog as this month’s storyteller (of the true rather than the fictional kind). You already know how much I enjoyed “Damp Dogs & Rabbit Wee”, as I recently awarded it 5 stars!